The Bulang tea harvesting area is located in south-west Menghai County, Xishuangbanna Prefecture, close to the border with Burma. There are several different tea harvesting areas on Bulang Mt. and each area is inhabited by a different ethnic group who makes unique tasting tea based on the types of tea trees they have and on their individual cultural preferences on how their tea should taste. This mini beeng cha is made from a Bulang Mt. 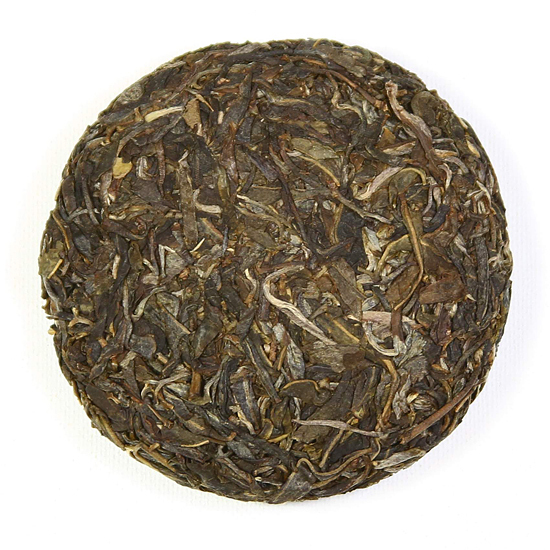 blend of mao cha made from early spring pluckings of tender leaves and tips. On the wrapper in English is the word prevernal which is used to indicate this very early leaf material. Bulang Mt. teas are known for their strength and vigor and power in the taste. This tea fits that description. 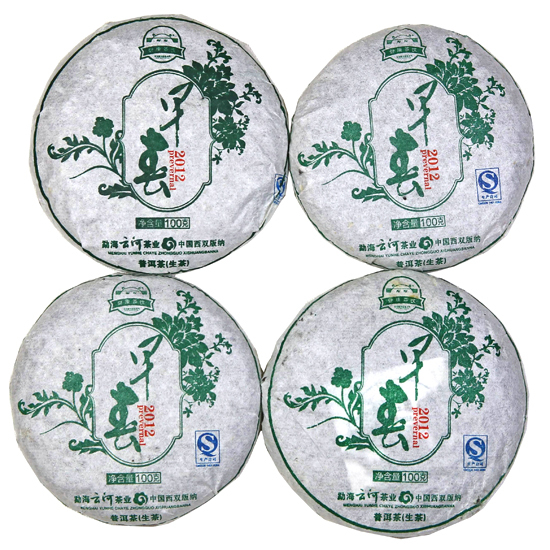 The weather here is hot and humid so the mao cha and the finished cakes tends to gain strength from the weather which can jump-start maturity. The cake is composed of an attractive blend of various sized leaf with a good bit of silvery leaf dispersed over the surface of the cake. A Chinese friend said that these cakes are a good representation of the style of Bulang Mt. teas, and that they are very well-made. The tea is not smoky tasting and is not too astringent or bitter, which many Bulang Mt. teas can be. 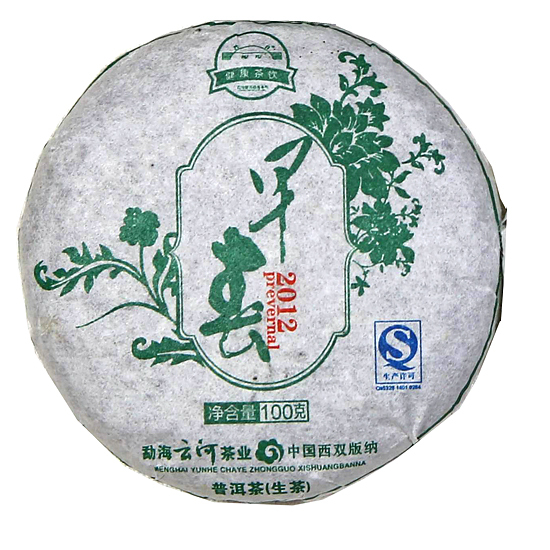 The tea is aromatic and delivers un-expected sweetness at the finish. The expectation is that these are a good investment for those looking to add a few reasonably priced, well-made and distinctive sheng Pu-erhs to their collection. But beyond that and knowing the name of the tea factory that made it, we do not know much about this cake. We have had these mini beeng cha in storage for some time now and decided that it was time to let our customers have at it and see what they think. If you try one and love it, order more soon as we don’t have many of these.